Fresh noodles—and perspective—at a Rainier Valley restaurant. As the bowl of pho arrives, a meaty red lobster claw breaks through the fragrant heap of cilantro and thinly sliced red onion on top and dangles over the edge of the bowl. The tail, split open to reveal an abundance of sweet, buttery meat, floats on the surface, a parcel of luscious, coral-colored roe tucked inside. There's a whole lobster lurking in Wicked Chopstix's lobster and scallop pho ($19), and it holds you in its thrall from the moment it lands on your table. While the broth wasn't made from a seafood stock (which would push a great dish into the realm of heavenly), it was decadent, delicious, and thoroughly unexpected. As I slurped and slurped, breaking and cutting through bits of shell (a cracker and seafood scissors are thoughtfully provided), the soup growing more flavorful the longer the lobster steeped in it, I wondered why we don't see bowls of pho made with Dungeness crab or spot prawns around town. There's no shortage of good Vietnamese food in Rainier Valley—mostly banh mi and long-simmered soups served in the many small, tried-and true, unassuming spaces that line MLK. But Wicked Chopstix, open since May, stands out by offering a dining experience that feels entirely fresh. The modern decor—white subway tiles lining an open kitchen, industrial metal touches, an abundance of plants—hints at the creativity at work, including bone marrow served with taro chips or veal pho. Obama Noodle ($13, traditionally called bun cha ha noi, but named here as an homage to the famous meal the former president shared over a cold beer with Anthony Bourdain in a Hanoi restaurant) is served on a bamboo tray overflowing with greens and three kinds of meat, the best of which is smoky, freshly grilled pork bathing in tangy, sweetened fish sauce. Cha Ca La Vong ($15), white fish flash-fried and served sizzling on a hot cast-iron platter, comes in a cloud of wonderful scents: fresh dill, earthy turmeric, red chili, and the sweetness of onions and fried shallots. Crunchy peanuts and a pungent fermented fish dipping sauce complete the dish. 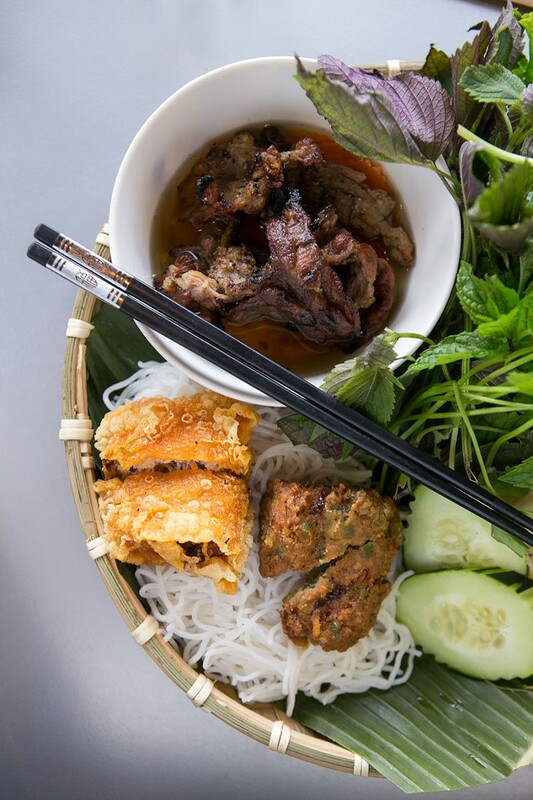 Both entrées are served with rice noodles and at least four kinds of fresh herbs to wrap up in crisp lettuce leaves. This is food that demands your attention and participation, asking you to play with textures and flavors, personalizing each bite to discover what tastes best to your tongue. As she cleared our table, manager Ida Nguyen, whose warm service is a highlight of the restaurant, told us about a soon-to-be special, something the kitchen has been testing for weeks: chicken pho made not with rice noodles but ribbons of zucchini. In front of the restaurant, traffic speeds up and down MLK, cars pull in and out of the busy Empire Way shopping plaza, while light rail trains zoom by, bells clanging. Outside the Washington Cafe and Club, a neighboring Ethiopian and Eritrean bar, recycling tubs overflow with St. George beer bottles. But the back of Wicked Chopstix is an entirely different scene: a tiny thriving herb garden, a riot of green amid concrete. Mint, rau ram, purple perilla, and scallions, their leaves and stalks freshly snipped to garnish dishes, grow upward, swaying lightly in the breeze.